Salix, also known as Furosemide is a diuretic, which means it expels retained fluids. It is commonly used for dogs and cats suffering from congestive heart failure, liver disease, certain kidney disease and can also be part of a treatment in animals with high blood pressure. 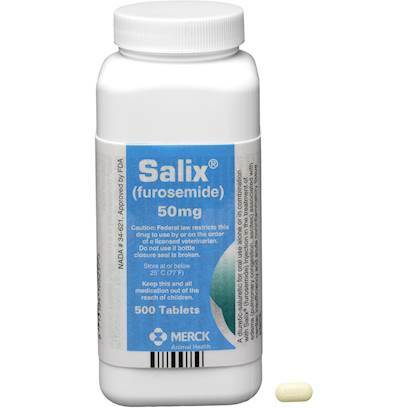 An effective and affordable generic to Salix is Furosemide. Only give the amount prescribed by your veterinarian. Dosage may vary over time to ensure your cat or dog gets the most effective results from it. Periodic blood tests as well as kidney or liver function tests may be necessary. Salix is available by prescription only. Follow directions given by your veterinarian. The usual dose for dogs is 1-2mg per pound of body weight given in 6 to 8 hour intervals. Cats usually receive doses of 1mg per pound of body weight once a day. Make sure your animal has plenty of fresh water available, this medication will increase the amount your cat or dog urinates.